Home > Climate and Energy > Climate Change and the Law: Can anyone really have a right to sun? 09 Apr Climate Change and the Law: Can anyone really have a right to sun? Can anyone really have a right to sun? 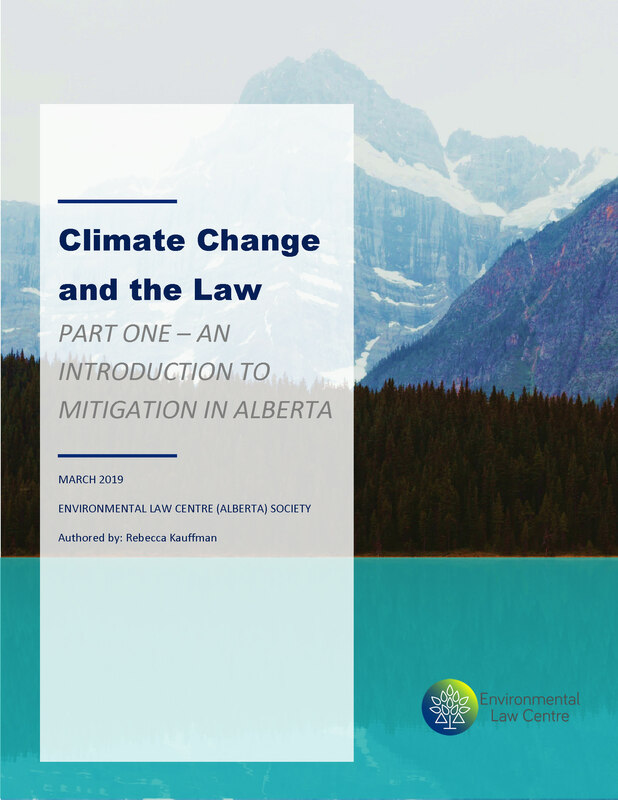 The Environmental Law Centre (ELC) recently published its report on Climate Change and the Law which consists of two parts: Part One – An Introduction to Mitigation in Alberta and Part Two – An Introduction to Adaptation in Alberta. Part One introduces readers to the idea of mitigation and how it can help Alberta meet its climate goals. Part Two provides a broad overview of the issues Alberta is likely to face due to climate change and the legal tools and measures that can assist with adapting to these issues. This blog post is part of a short series that highlights and features select excerpts from the report. In the first volume of this report, we focused on climate mitigation and the use of renewable energy sources to mitigate some of the effects of climate change. One of the renewable energy sources we took a closer look at was solar photovoltaic (PV) energy. Solar energy installation has taken off in the last few years in Alberta and you are much more likely to see solar collectors installed on buildings near you today, than just a few years ago. Alberta even has its first commercial solar farm, located near Brooks, Alberta – with more to come. Solar energy may seem like a particularly home owner friendly technology, especially with lowering costs and new government run programs such as the PACE program (see blog posts PICKING UP THE PACE AND RUNNING WITH CITY CHARTERS: UPDATE ON MUNICIPAL GOVERNMENT ACT and Keeping up the PACE: An update on the Pace Program and Associated Regulations). However, with ever increasing development in our municipalities along with a push for more density (as another means to lower our energy use) challenges have ensued. What happens if the solar panels installed on a commercial building are now impeded by a 50 storey condo or the ones on a home are blocked by a taller house next door? In this blog post we consider whether a property owner can enforce their right to solar access under current Alberta law. The idea that a person can have a right to light comes from English common law. This historical right recognizes that a person has a right to access any light that was previously accessible to them. This means that an individual can ask the courts for a remedy if their access to light is being impeded. In fact, this is a right which is still being litigated in the United Kingdom today. In fact, the Court of Appeal for England and Wales has heard cases on the right to light as recently as 2016 when, in Ottercroft Ltd v Scandia Care Ltd, the Court upheld a mandatory injunction against a developer who infringed upon an adjoining owner’s right to light. In contrast to the English courts, a common law right to light was specifically eliminated in Alberta through the Law of Property Act and no similar right has been created since. Although the idea of a ‘right to light’ did not seem to be an issue in Alberta before the advent of solar collectors, it does mean that today there is no property right to sunlight. Anyone can make use of accessible sunlight, but they have no right to the same. If someone’s solar access is limited or even eliminated there is no statute to turn to. So, what does this mean for the increase of solar energy usage in the province? One of the most obvious answers to this dilemma is to regulate or legislate a right to sun. The Town of Millet has attempted to restore the right to light through their municipal bylaws. The town’s Land Use Bylaw 8.8(4) guarantees a right to sun stating that “[no] development permit shall be issued for the construction or enlargement of any structure which would significantly reduce the amount of sunlight falling on any solar radiation collector system which is complete or under construction at the time of application for that development permit”. This bylaw effectively guarantees access to solar energy for those individuals who choose to install a solar collector on their property. However, this has not led to an uptick of solar bylaws and in the meantime, individuals living outside of Millet are still installing solar panels on their rooftops. The options available to these people include, hoping that they will always have reasonable neighbours and, relying on the common law. Easements, restrictive covenants, and tort law are all possible means of enforcing one’s right to sun. However, they also all come with drawbacks. One of the major drawbacks is the fact that easements, restrictive covenants and tort law can only be enforced through the court system, which is expensive, slow-moving, and never guarantees a result. Despite these challenges, without a legislated right these may be a landowner’s only options. In light of this, the next section will outline some of the options available to property owners hoping to enforce a right to sun without a municipal bylaw to rely upon. Negative easements can be purchased on an adjoining property and allow a landowner to restrict activities on any adjoining piece of land. This may include restricting the height or placement of nearby buildings to ensure that solar access is maintained. Easements may be acquired by an express grant, implied grant, or by prescription and apply to all future landowners, even after the land is sold. Continuity is ensured because an easement is registered on title and follows the land, not the landowner. A restrictive covenant is an agreement that can be made between landowners in a community. For example, a community can get together and agree to place a restriction on their collective property limiting the allowable height for all homes in the area. Restrictive covenants may be implemented by community members or by a developer. They are also registered on title and apply to future landowners. In certain ways, restrictive covenants may be a more effective option because they apply to a larger area. To otherwise reproduce the effects of a restrictive covenant, a landowner would need to purchase an easement from multiple neighbours and will have to incur the costs and time to do so. A restrictive covenant could even include a requirement that all future homes in a neighbourhood or development are built solar ready. There are, however, challenges to enforcing both easements and restrictive covenants. One difficulty that arises with both these legal instruments is that they can only be enforced through court action. This means that even if you have an easement or restrictive covenant in place, you cannot do anything to prevent someone from breaching it. Rather, you can only rely on court proceedings started after the breach has occurred and which can generally only offer damages as a remedy. This is in part because municipalities do not keep restrictive covenants or easements on file and are not required to comply with any existing restrictive covenants or easements when drafting zoning bylaws or when approving new developments. Additionally, litigation can be both costly and time consuming and may not be an option for all landowners. Furthermore, there is still no case law that deals with a right to sun in the context of a solar collector. This would make it much more difficult to predict how a court would decide, should a landowner attempt to enforce their easement or restrictive covenant after a breach. Bearing these challenges in mind, the next section will provide an overview of some of the ways that a homeowner could fight the loss of solar access in court. One option for court action is to sue a neighbouring landowner for nuisance. Nuisance is defined as the “unreasonable interference with the use and enjoyment of land.” It is a tort, or civil law action, that provides landowners with the opportunity to access the courts in order to prohibit or force a neighbouring landowner to change behavior that is negatively affecting the use and enjoyment of their land. In the case of a right to sun, a landowner may be able to sue a neighbour for erecting a structure that interferes with a solar collector. However, it is likely that to succeed, a solar collector would first need to be considered a reasonable use of the land. As of today, there is no case law to that effect. Rather, the leading case on the right to sun and its implications for the tort of nuisance is Earl Putnam Organization Ltd v Macdonald. In this case, the Court found that there was no cause of action for private nuisance. However, Earl Putnam may be distinguished on the basis that the right to light being requested in Earl Putnam was for enjoyment, rather than for powering or heating a home through the use of a solar collector. A similar tort is the tort of public nuisance. Public nuisance is defined as “unreasonable interference with the use and enjoyment of land” that inconveniences many people and offends the public interest. It is likely that before the tort of public nuisance could be used to enforce a right to sun two changes would need to occur. First, there would need to be more recognition of a solar collector’s usefulness. Second, there would need to be more commercial solar use because a finding of public nuisance must affect a significant number of people – for example through interference with a solar farm. A third option would be to rely on the tort of trespass. Trespass is defined as the intentional direct invasion of real property (land). In order to find trespass, damage to the land does not need to be shown but there must be evidence that the land is privately owned and that it was intentionally trespassed upon. For our purposes, trespass may be used to enforce one’s right to sun, because of the common law rule that a landowner owns the airspace directly above their property. A landowner may be able to access the tort of trespass if it is found that their neighbour has built something overhanging the landowner’s property, therefore infringing upon the airspace, and in turn, potentially preventing the landowner from properly using a solar collector. The difficulty in proving trespass occurs, in part, because of the angle of the sun in Alberta. Due to its northern latitude, the sun does not descend straight down onto the earth, but rather it descends on an angle, which also means that it passes through the airspace of another property before getting to the property in question. Therefore, trespass would likely only be effective in cases of substantial land ownership, where the sun’s rays do not need to pass over another piece of land before reaching a solar collector. Notably, there is no case law to help predict the rate of success that people would have in bringing these claims and along with this unpredictability, litigation is cost-prohibitive. A better option, and one that would make the business model for solar developers more appealing, would be to have solar access legislation in place. Although the idea of solar access legislation may seem far-fetched, it already exists in certain other jurisdictions – jurisdictions with significantly more installed solar technology. allows cities and counties to require the dedication of solar easements in certain subdivisions. Solar energy technology has already seen a dramatic increase in use in Alberta and solar access legislation, similar to that which can already be found in California, could result in Alberta becoming a leader in solar energy. This is particularly because solar access legislation would help to reassure investors that their investments would be protected and would hopefully make solar energy more appealing to everyone. Stay tuned for next week’s blog post which will dive deeper into some of the topics covered in the adaptation report. Ottercroft Ltd. v Scandia Care Ltd. and Dr. Mehrdad Rahimian  EWCA Civ 867. Law of Property Act, RSA 2000 c L-7, s 69(3). Town of Millet, revised by-law #2011/05, Land Use By-Law s 8.8(4). Ronald M. Khrulak, “A Legal Review of Access to Sunlight in Sunny Alberta” The Alberta Environmental Research Trust (1981) at 10 [Khrulak]. Residential Infill – City of Edmonton, “Restrictive Covenants” (7 April 2017) online: https://www.cityofedmontoninfill.ca/about/news/post/restrictive-covenants. Bruce Pardy, Environmental Law: A Guide to Concepts (Toronto: Butterworths Canada Ltd. 1996) at 193. Earl Putnam Organization Ltd v Macdonald (1978) 21 OR 815. Didow v Alberta Power Limited, 1988 ABCA 257. Alberta Agriculture and Forestry, “Agroclimatic Atlas of Alberta: Climate Basics” (16 January 2015) Government of Alberta online: https://www1.agric.gov.ab.ca/$department/deptdocs.nsf/all/sag6294. Go Solar California, “Solar Rights: Access to the Sun for Solar Systems” Government of California online: https://www.gosolarcalifornia.ca.gov/solar_basics/rights.php. Cal Civ Code § 714 & 714.1. Cal Civ Code § 801 & 801.5. Cal Civ Code § 801.5. Cal Gov Code § 65850.5. Cal Gov Code § 66473.1. Cal Gov Code § 66475.3.